Our backyard view of the Courtney Fire as it climbed the ridge on the opposite side of the valley we live in. Again, the DC10s saved us, dropping retardant on the ridge top. 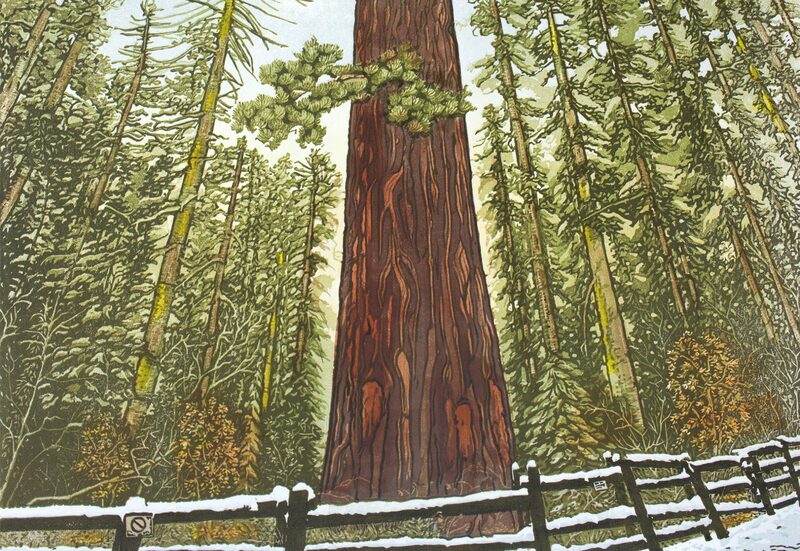 I was just about to give a lovely, little update on the super-carving-intensive, 9-color, single-plate, reduction linocut I had been working on for its debut at my first ever Sierra Art Trails in early October, when a series of unhappy, fire-related delays began. We’ve been evacuated or pre-evacuated 3 times in the last month, with the Junction Fire coming to within a half mile and the Scott Fire coming even closer. 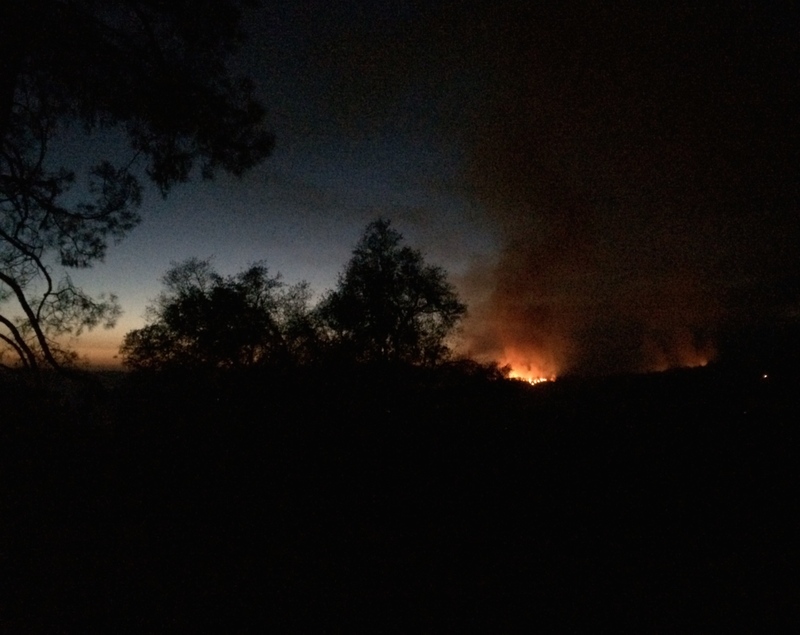 Luckily, the worst of the lot, the Courtney Fire stayed on the other side of the ridge. Welcome to life in the Sierras during its worst drought in recorded history. DH stayed behind during the Junction Fire to catch stray embers . This is my view from the ridge top I evacuated to, when the flames flared… and then died back as they hit the retardant the giant DC10s dropped late that afternoon on the ridge. While relieved and grateful for the heroic efforts of the firefighters, we feel tremendous sorrow for the many dozens of families displaced by these tragedies, some losing everything, including beloved pets and irreplaceable family heirlooms with their homes. Many others losing barns, vehicles, wellheads and outbuildings and more. The scars on the mountainsides will remind us of the dangers of fire for many decades to come. So, knowing that there is much more I could say about this experience, from the helpless insecurity one feels to the wonderful feeling of knowing you actually belong to a community that cares for one other, I will leave it there. 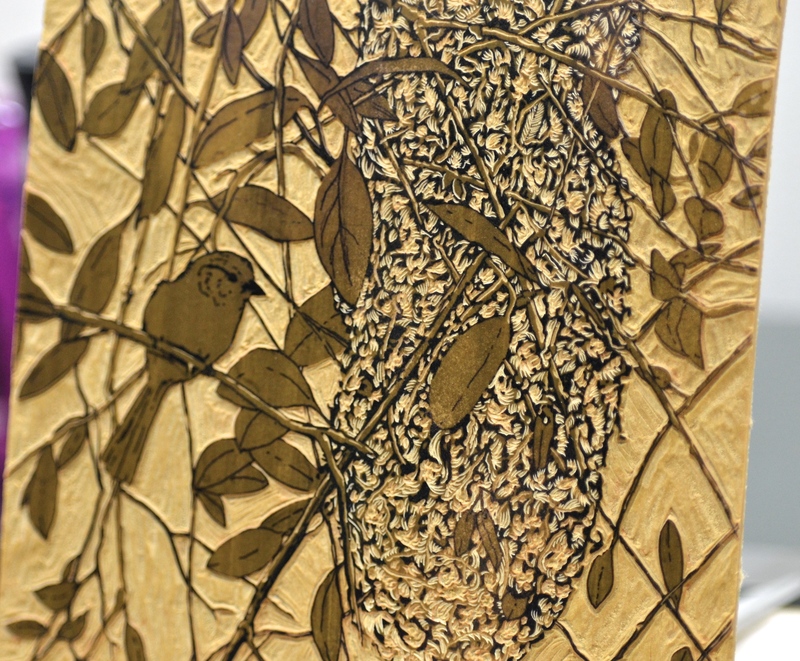 This is the lino plate after the 2nd yellow was pulled, ready for the ochre. Still lots of carving to do on the nest if I want to avoid it looking flat. 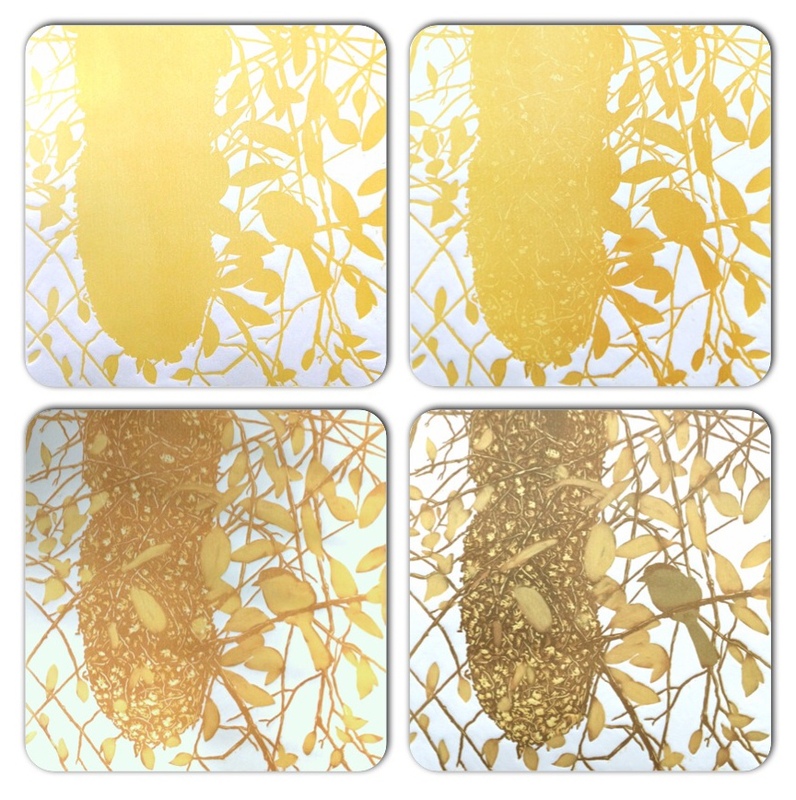 Four color progression in one shot: Yellow, Yellow-er, Ochre, and Brown. This was one of those pieces that just makes itself. There was no way to plan out each detail or exactly how the nest would develop. I always had a just pulled print to look at against the lino and carved from there. Sometimes, the carving itself is just as interesting to look at. 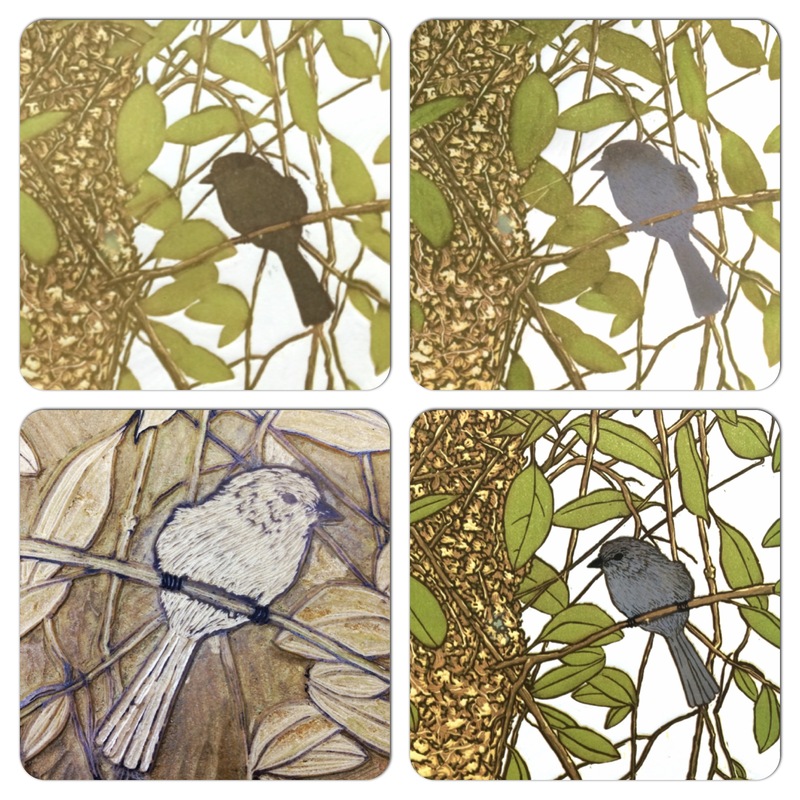 Some very delicate carving and a mask were utilized in bringing the Bushtit’s color into line. The rest is ready for the final color! I rolled the Green and Mint ink at the same time (the upper left hand square). 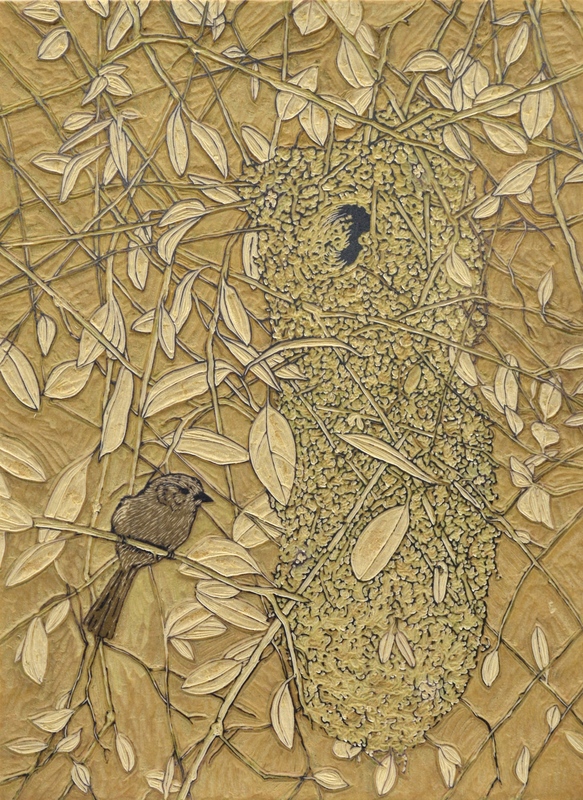 Then, using a mask, the bird shape was carefully run on its own in Gray-Brown. At first, I planned to ink the remaining plate with Black (test shown in the lower right square), but the effect was too heavy handed. 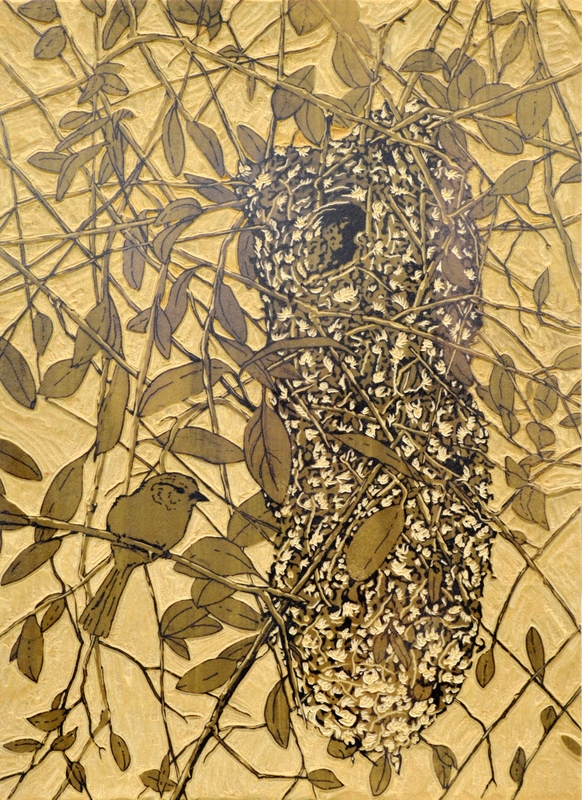 Instead, Raw Umber was applied overall, and using a tiny 1/4″ ink roller, Black was rolled onto the nest hole and bits of the Bushtit’s beak and feet. And here is the (nearly) finished 9-color print! After this, I signed them and applied the Red Tail Studio chop, creating an edition of 29 prints! This Spring, I watched this little guy build the nest, bring the food in and out (Yes, the waste is evacuated!) and eventually leave the nest with his brood. Now, with Fall in swing, I wonder if the big flocks of bushtits I see are some of the ones from this very nest! 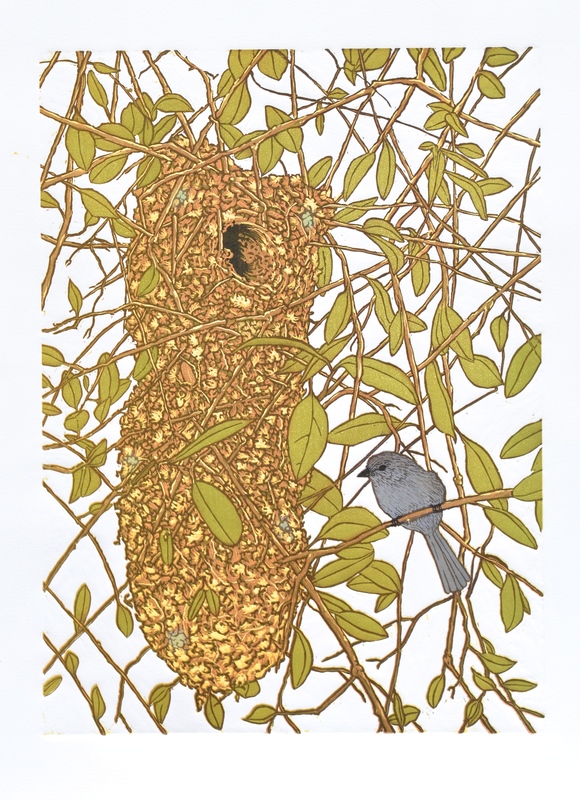 I was happy to present my second Nest Series print, Bushtit’s Nest, in mid-September to the Sierra Art Trails Preview Gala Exhibit, where it will reside until October 6th with the other 100+ amazing participants of this 3-Day Open Studio Event! 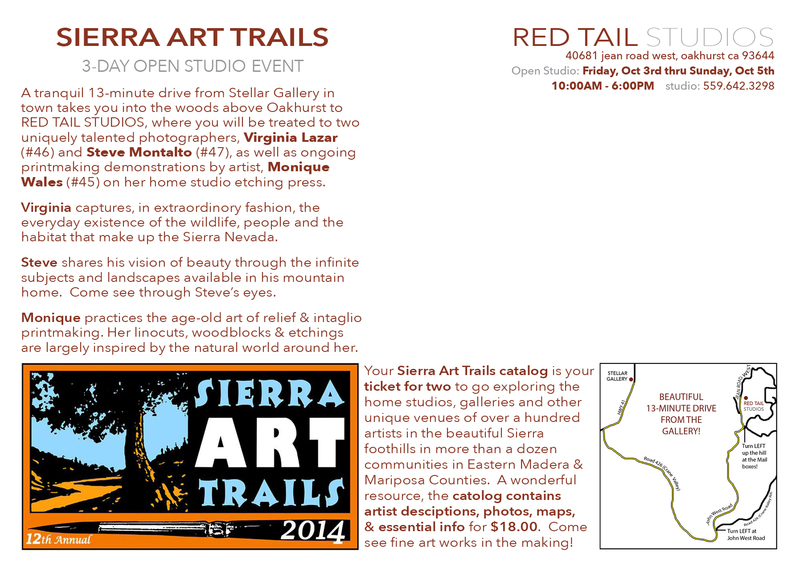 Sierra Art Trails is a chance to go exploring the home studios, galleries and other unique venues of amazing artists in the beautiful Sierra foothills in more than a dozen communities in Eastern Madera & Mariposa Counties. The catalog is the ticket for two and contains artist descriptions, photos, maps, & essential info for $18.00. I’ll have some on hand at the Studio! 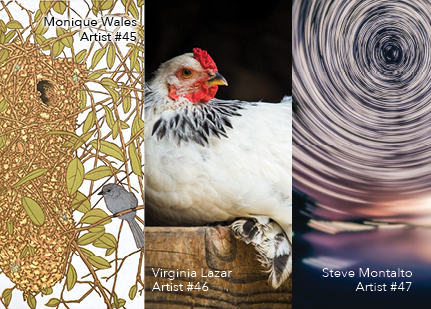 What you will see at Red Tail Studios: Daily printmaking demonstrations, a tour of the studio, the chance to meet and see the work of Virginia Lazar and Steve Montalto, two very different, yet equally talented photographers. Please come by if you are on ‘The Trail’ this year!